I would be remiss to say the past 24 hours have been easy. I’m overwhelmed at the well wishes I have received and wish I could thank each one of you personally (maybe I can at Open House next week) for the support you have given to me and this school over the past four years. Thank you. This weekend is the 2 nd Annual LISD STEM Festival. There will be a LOT of cool activities for the kids to participate in. The CANgineering competition will be a really fun competition to see. I hope you can join me at LHS on Saturday. Don’t forget Open House is next Thursday, March 7. To help with traffic, we are asking families with last names A-L to attend between 5:30-6:15 PM and M-Z from 6:15-7:00 PM. Of course, you can come any time if these time frames don’t fit your schedule. Denim & Diamonds – The Party! Thank you to everyone who made the 2019 Denim & Diamonds a fun and successful party. Sponsors, donors, auction bidders, LISD staff and volunteers all came together to make it happen. $322,000 was raised to support education in LISD. The new format was a big hit, so we will make some tweaks and do it again next year. Mark your calendars – February 22, 2020. Our spring book fair is scheduled for March 4-8. This fair is themed #pusterkind , and we will be fundraising and collecting book donations for libraries in need. As always, we will be supporting Teaching with Jamaica and the creation of a new library in a Jamaican school this summer. Additionally, we will be making donations to Harmony Grove Middle School in Haskell, Arkansas. The Harmony Grove School District has recently opened a library dedicated to its 4th through 6th grade middle school students but has very little funding to support its development. Currently, the collection total is 1,142 books to be shared by 296 students. The American Library Association recommends 15-20 books per student. Please help us build their collection by either donating spare change or purchasing a book to donate. We will be promoting the message "Everybody deserves a library!" and would sincerely appreciate your family's support with this endeavor. See you next week at the #pusterkind Book Fair! Kindergarten Roundup is a registration opportunityfor parents of kindergarten age students for the 2018-2019 school year. i f you have a child who will be 5 years of age on or before September 1, 2018 please plan to attend this come and go event. 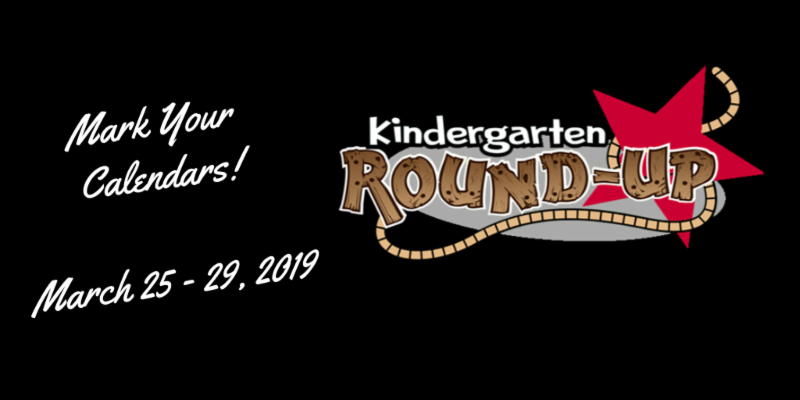 Kindergarten Round-Up is a parent event only. Students and parents will be invited to the school in May for a Kindergarten Sneak Peek. Cold and flu symptoms: PLEASE keep your student home until they are symptom free! Temperature of 100.0 degrees or more: Student must be fever free for 24 hours, without medication, before returning to school. Vomiting or Diarrhea: student must be symptom free form 24 hours, without medication, before returning to school. Driver's License must be presented and scanned with every visit and student sign out, no exceptions. February 7 - March 1. The campout is April 26-27th. Packages start at $150 for one child and one parent. It is $25 per additional children. There are additional packages that include early entry and priority parking. Registration costs include camping, food and all of the activities. 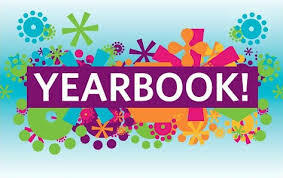 Look for your registration packet in last week’s Thursday folders. 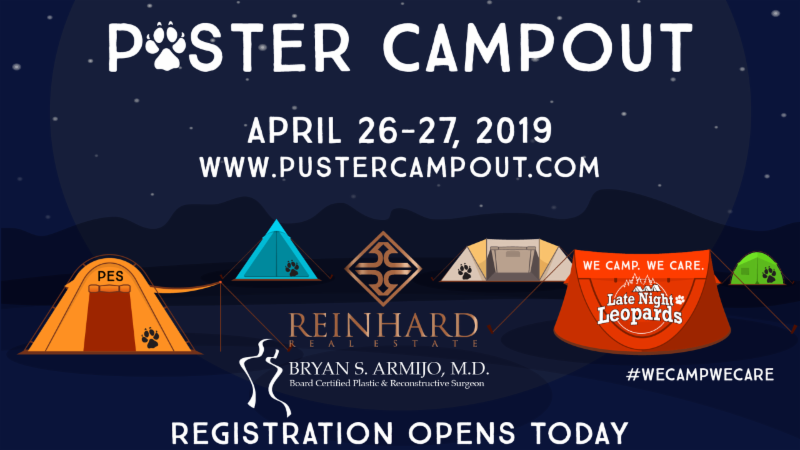 Register online at pustercampout.com . 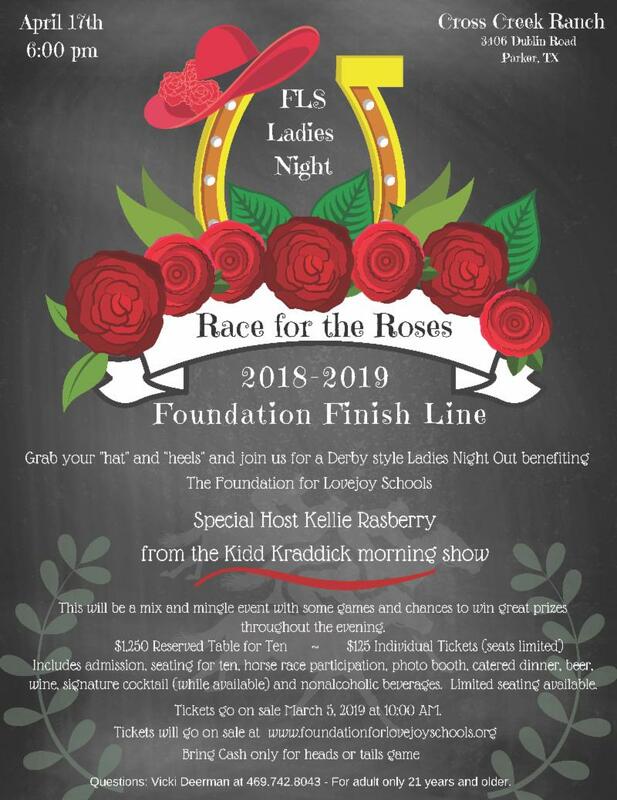 Please join us for a fun-filled evening under the stars. 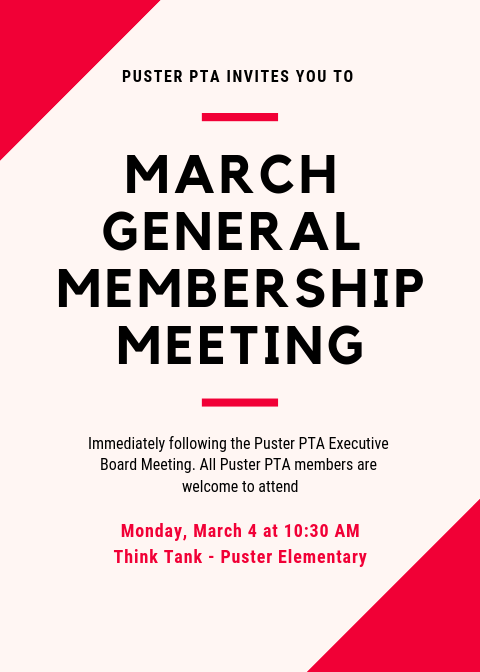 This is great way to continue building our Puster Community. Watch D.O.G.S. 2.0 "Another Year, Another 100"
Take a day or ½ day to be a hero for your child. 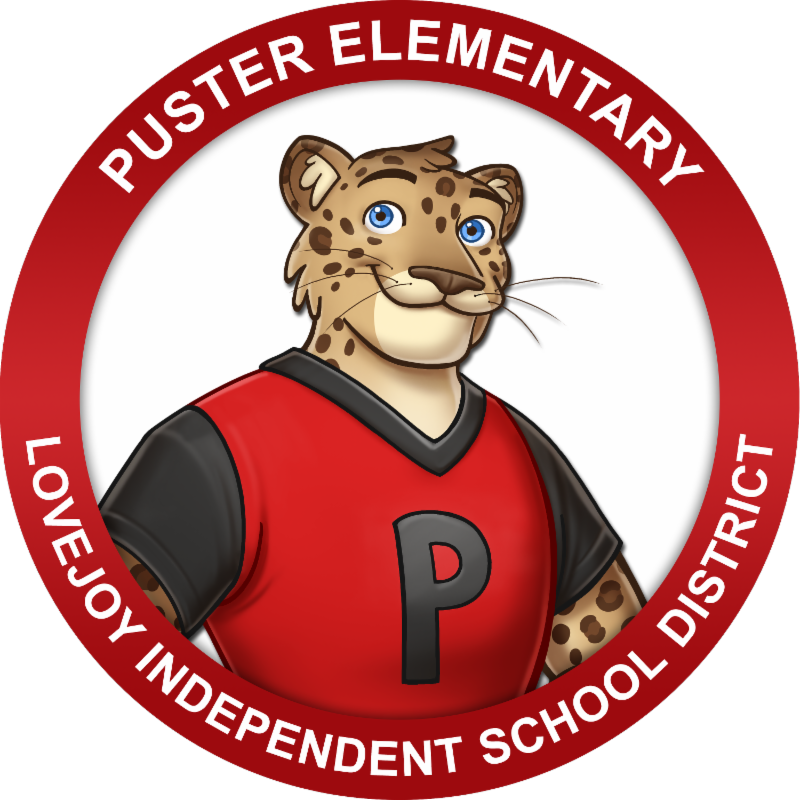 Get your picture on the Puster Watch D.O.G.S. wall with your child. Signup below for your day. Let’s see how fast we can fill this up. What is WATCH D.O.G.S. and how do you participate? Watch D.O.G.S. is a program that helps bring dads and other male role models into our school. Dad's spend a day with their child at school and get to interact alongside the teachers, help with carpool, monitor hallways, help out in the classroom, help with specials...the possibilities are endless. Have you completed the districts background check? 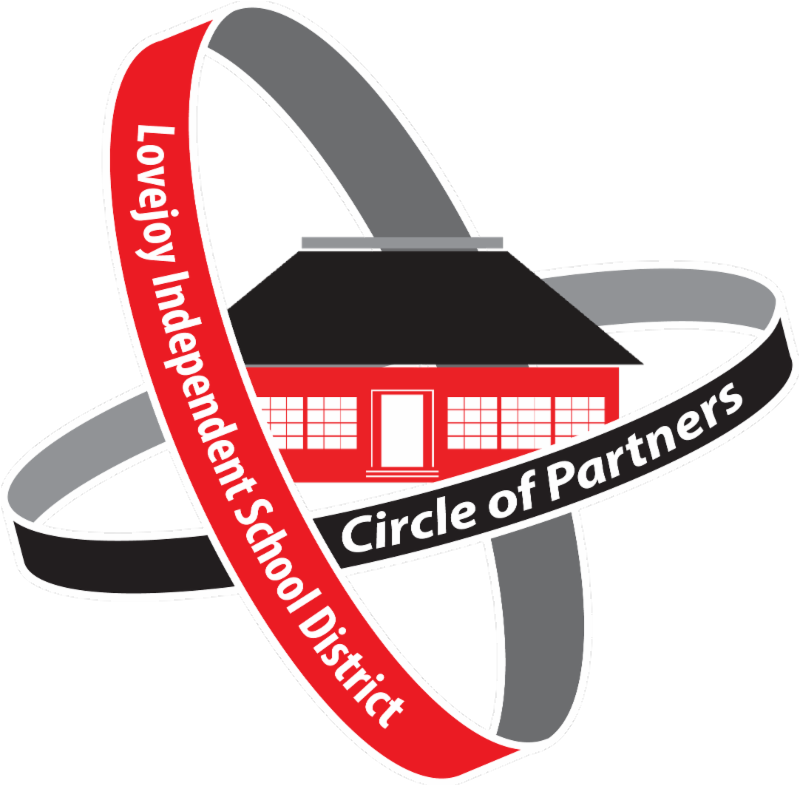 Lovejoy ISD Volunteer process for the 2018-2019 school year is not yet open. Should be soon. Each Watch D.O.G. 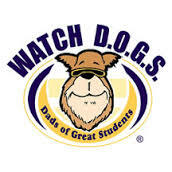 dad is encouraged to wear a Watch D.O.G.S. T-shirt on the day he is volunteering at the school. Your child/children may also want a "My Hero" shirt to wear that day too. Below is the link to purchase your t-shirts. Watch D.O.G. t-shirts are not required but it's encouraged. If you have any questions you can contact Henri Friloux at henri.friloux@gmail.com or 972-365-5478. Come out Friday night to hear the Puster Pride Choir sing the National Anthem for the Allen American hockey game this Friday, March 1st 7PM. It's a fun time and a great way to support our choir kids. Save the date for the annual 3rd grade folk dancing night! All 3rd graders will demonstrate folk dances from around the world and audience participation is encouraged. 3rd grade parents can access the online permission form HERE . #pusterkind Book Fair-- Mark your calendars! Our spring book fair is scheduled for March 4-8. This fair is themed #pusterkind, and we will be fundraising and collecting book donations for libraries in need. As always, we will be supporting Teaching with Jamaica and the creation of a new library in a Jamaican school this summer. Additionally, we will be making donations to Harmony Grove Middle School in Haskell, Arkansas. The Harmony Grove School District has recently opened a library dedicated to its 4th through 6th grade middle school students but has very little funding to support its development. Currently, the collection total is 1,142 books to be shared by 296 students. The American Library Association recommends 15-20 books per student. Please help us build their collection by either donating spare change or purchasing a book to donate. We will be promoting the message "Everybody deserves a library!" and would sincerely appreciate your family's support with this endeavor. We would love to have your help preparing and running our book fair. Please take a look at the sign up linked below and consider helping during this very exciting and busy week. Bonus-- volunteers receive 20% discount! Have you heard the term Makerspace from your student but not sure what it's all about? Lovejoy Librarians will be setting up a Makerspace showcase at LHS on the day of the STEM Festival, Saturday, March 2. Be sure to seek us out and stop by for some fun! The 2nd annual STEM Festival is this Saturday! We hope you will join us at Lovejoy High School from 10:00 AM – 3:00 PM. The day will be filled with fascinating speakers, hands-on activities, Makerspace, student demonstrations, robotics, competitions with prizes, food trucks and more! 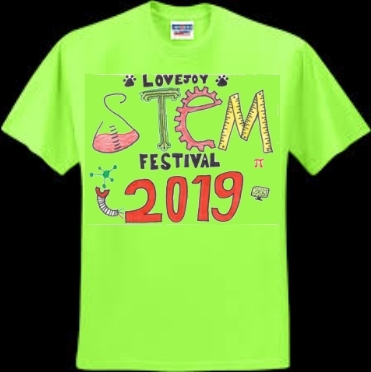 For all of the latest STEM Festival updates follow us on Twitter at @LovejoyStemFest and #lovejoystemfest. Also, download the STEM Festival app. 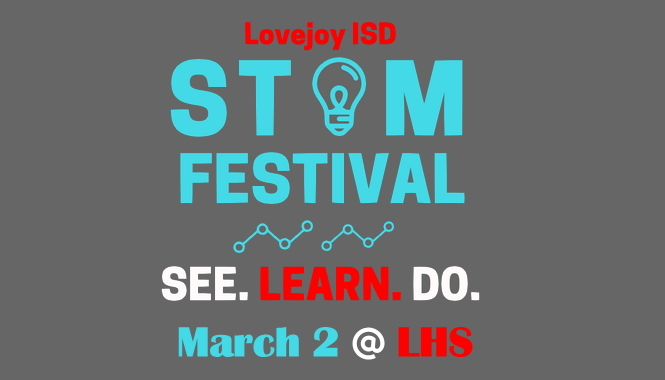 Search for “Sched” in the app store and then search “Lovejoy” to find the STEM Festival. Don’t forget to register your team for the first ever CANgineering Competition. The competition will be held during the Lovejoy STEM Festival. Registration has been extended through noon on Friday, March 1. Additional information including registration information may be found at bit.ly/stemcan . 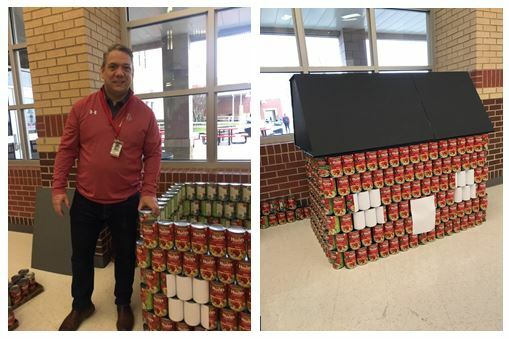 Pictured below: Deputy Superintendent Dennis Muizers helps construct the Red School House for the CANgineering competition. Congratulations to Emily Dillon, SCIS 6th grader, on designing the winning t-shirt. You may pre-order this fantastic shirt at bit.ly/STEMfesttee through RevTrak. T-shirts will be available for pick up at the STEM Festival and will also be sold for $10 at the event. 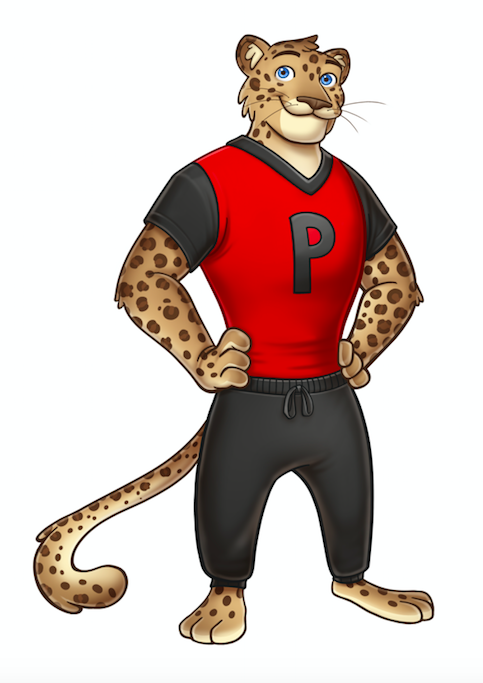 Learn about the Lovejoy Pre-K - 12 academic, STEM, fine arts, and athletic programs. Visit with students, parents, teachers, and administrators. Meet personally with elementary, intermediate, middle, and high school principals. Enjoy our STEM Festival with our award-winning STEM students and teachers. We hope you will help us share this information. Any family interested in attending the Open House may email Stacey Dillon , Assistant to the Superintendent, for additional information or to register for the event. You may also contact Stacey by phone at 469.742.8003. This annual Lovejoy Tournament continues to be a hit around the metroplex. Come join your fellow chess players on March 30 at Sloan Creek for a wonderful day of chess play. This five round tournament awards the top three players in each section a trophy and fourth place receives a chocolate bunny. Gather up a team from your school and compete together. Registration is going on now. 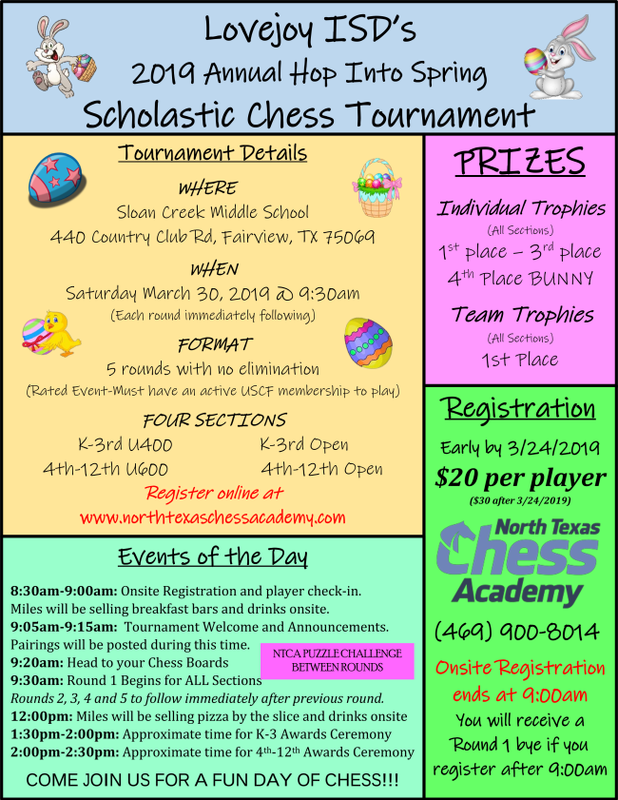 Please visit North Texas Chess Academy's website to register. The referral window for students in grades 1-11 for gifted and talented services is open February 1 - March 8. Referral forms are located online in the PowerSchool Parent Portal. Testing is scheduled for Saturday, March 30 and April 6. Appointments will be sent via email after the referral window closes March 8. Please note: Kindergarten students will not be tested during the spring window. Looking for More Information about G/T Services? Brief information sessions will review the gifted and talented referral process and services offered in Lovejoy. If you are unable to attend and would like more information, a slideshow presentation is available on the gifted and talented webpage. Brie Smith ( 469.742.8032 ). Celebrate the 50th anniversary of the first people to land on the moon with the Lovejoy Gifted Association's Rocket Fest. 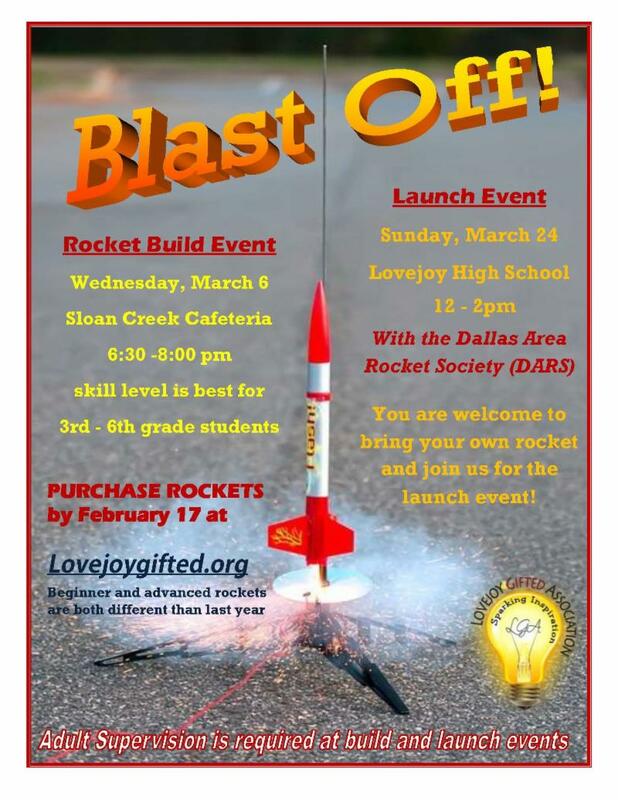 The Lovejoy Gifted Association is partnering with the Dallas Area Rocket Society (DARS) for their annual LGA Rocket Fest. This event is suitable for students in grades 3 thru 6. Participants may choose between a basic and an advanced rocket model. There will be a Rocket Build Party in the Sloan Creek Cafeteria on Wednesday, March 6th from 6:30pm to 8:00pm where a volunteer from DARS will talk the junior rocket scientists through building the basic rocket step-by-step. Participants purchasing the advanced rocket may pick up their build package that same evening and are welcome to start building at SCIS or build at home. The rocket launch will be held on Sunday March 24 in the front parking lot of Lovejoy High School at 12:00 noon, where volunteers from DARS will provide the launch equipment and make sure the launch process happens in a safe and orderly fashion. 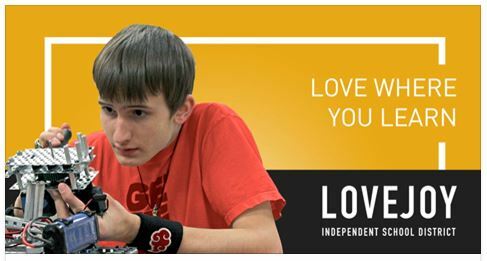 You may reserve a spot and purchase your rocket kit from the Lovejoy Gifted Association Store at https://my.cheddarup.com/c/rocket-fest-2019 no later than Feb 17th, 2019. Each rocket package comes with rocket engines for two launches. Please note that junior rocket scientists must be accompanied by an adult at both events. The Lovejoy Gifted Association is a non-profit organization that supports the G/T programs across all schools in Lovejoy ISD. The LGA Rocket Project is a fundraiser and proceeds will flow back into Lovejoy ISD. If you have questions, contact Jay van Rijn at jeroen.van.rijn@gmail.com. 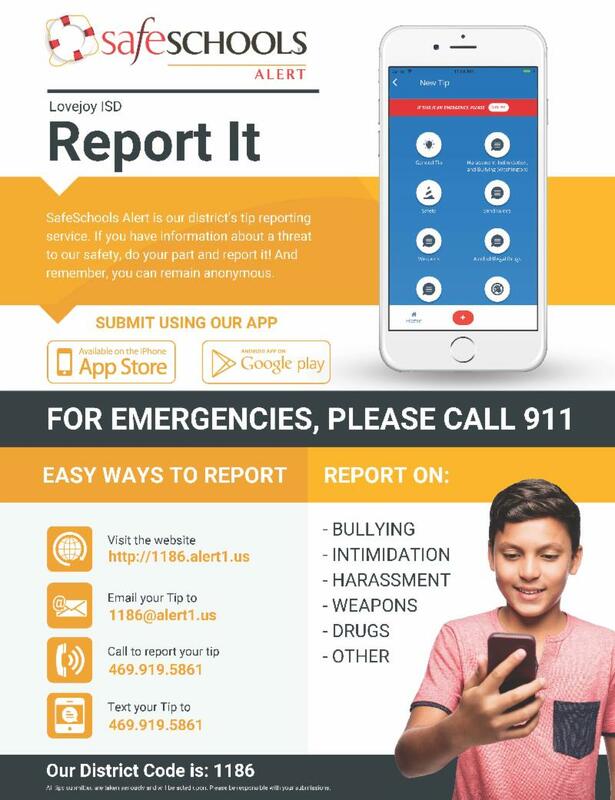 Lovejoy ISD is partnering with BrightBytes, an educational research organization, to learn more about our students’ school and home technology use and the impact it has on instruction. We are reaching out to ask you to take part in the Technology & Learning questionnaire. This is a semi-annual initiative, and your participation is essential in helping us form a more complete picture of the role technology plays in your students’ learning. Please know that all of your responses will remain anonymous to protect your privacy. On behalf of Lovejoy ISD we would like to thank Jones Solar and Roofing for participating in the Lovejoy ISD Circle of Partners . We thank Jones Solar and Roofing for their support of Lovejoy ISD and the important value they place on the education of our children. Chadd Jones of Jones Solar and Roofing is pledging 10% of their profits on roofing and solar work completed in the Lovejoy ISD. 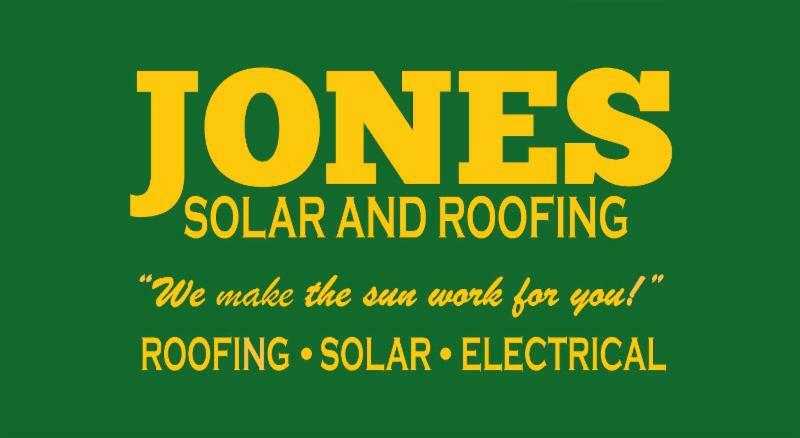 Jones Solar and Roofing provides free inspections of your residential or commercial roof and property. They also offer free estimates on Solar/ Battery and Energy Efficiency upgrades to your home or business. Their website is: https://jonessolar.com/ or you may reach them by phone at 214.412.7444 for residential or commercial properties. Members of his family have been supporters of the Lovejoy ISD since 1979. Chadd and Liesl Thompson Jones are the proud parents of Puster Elementary 1st grader Maxwell. 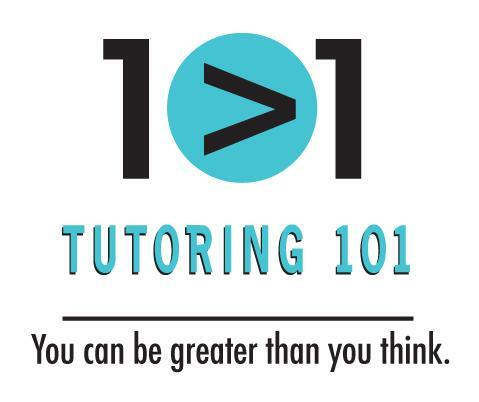 Lovejoy ISD is pleased to welcome Tutoring 101 to the Circle of Partners . Tutoring 101 and Lovejoy ISD have formed a revenue generating/sharing partnership to bring their services to Lovejoy families. Please see below for several offerings. 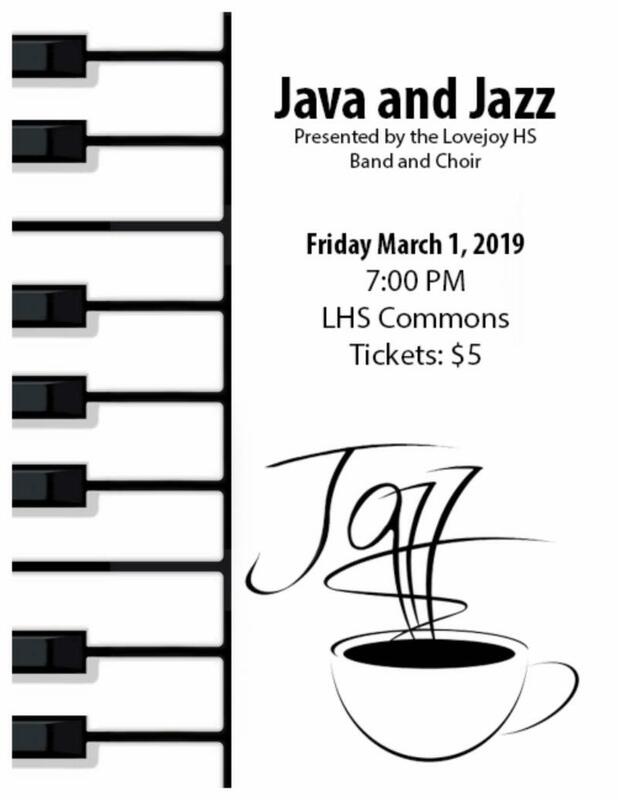 The Lovejoy High School third annual "Java and Jazz" joint concert with the Lovejoy Jazz Band and LHS vocalists will be here before you know it. Join us for an evening of great music starting at 7:00 PM on Friday, March 1. The musicians are sounding great and have a huge program to perform. Admission is just $5.00. Coffee and dessert items will be available for a small fee. There will be an open dance floor for students and parents alike. The musicians and vocalists will perform a combination of classic swing-era classics and slow ballads. We hope to see you on the dance floor.